The California Poppy, Eschscholzia californica is the California State flower, it is a beautiful bright spot that is starting to pop in the landscape welcoming the warmer weather. 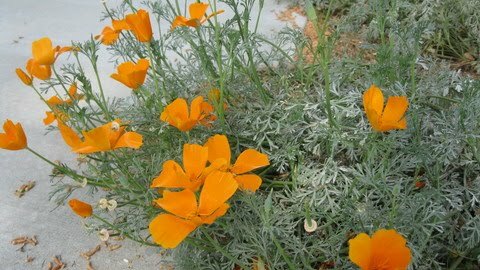 The California poppy is nyctinastic, which means that it closes up at night and on cloudy days, so it is a fun plant for children. It is a perennial here in California but is used as a summer annual elsewhere. It can be grown from seed or from seedlings. If you buy a plant in a 4” pot or 1 gallon it will have soft nursery soil and transplanting will be easy, however care should be taken not to transplant from one part of your garden to the next because the taproot can be easily damaged and the plant will not survive. 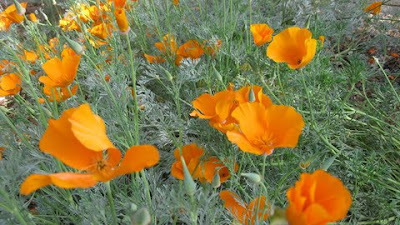 Since it re-seeds readily, your poppies will likely end up where they want to in the years to come. Planting from seed is best done in the fall, broadcast the seeds over well-drained cultivated soil and be sure that they receive water. They are a drought tolerant plant, but need water to germinate. This is one of those California natives that you can easily mix into a non-native garden bed because if they are irrigated it will just extend their flowering season. Now is a great time of the year (March/April) to plant the 4” pots that you will start finding in the nursery. If you chose a variety of California poppy hybrids (different colors) and plant them in succession your bed will look beautiful for many months. In mild climates these flowers will bloom from spring through summer. Poppy care is pretty straightforward; remove the spent blooms, dead stems and leaves. It is also good to cut them way back once in a while to let them revitalize. they They are great on a hillside, parking strip, or anywhere that they can fill up a big area. If you use them as a backdrop they will serve you well and you won’t have to fuss a lot with maintenance. One caution – they do not make a great front and center focal point because they get ratty looking on their way out and then you have to maintain them so… Use them in the right spots. 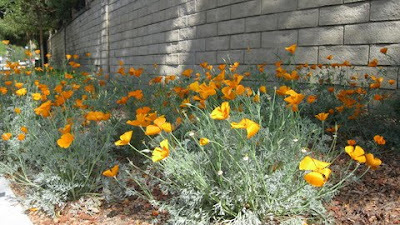 They also pair very well with the other native “poppies”. You can create a mixed poppy field by planting them as the lowest layer with Bush Poppy (Dendromecon rigida) and Matilija Poppy (Romneya coulteri) – the Bush Poppy gets 4’-8’ high and 4’-6’ wide and the Matilija gets 5’-8’ high and spreads so be sure that you have room! Because the Matilija spreads, I would plant fewer than you want and pull out new arrivals once you have gotten to the amount you want. You can always share them with friends! 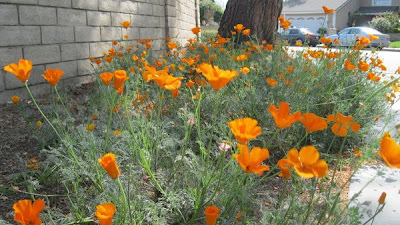 All three of these like well-drained soils (the Matilija is more forgiving and can adapt to most soil types) so don’t plant the California & Bush Poppies if you have clay soil. My final note: please, please, please take care what types of California Poppies you plant if your planting area is adjacent to an area that already has native poppies growing. If you plant hybrids you could be introducing a problem. The seed varieties can interbreed and eliminate the native varieties. 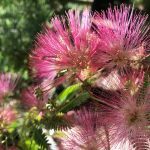 If you want further information on planting near an existing native planting, please check out The Theodore Payne Foundation – they are an amazing resource.